Both the recipes are absolutely easy to make even in large quantities and so delicious. I actually rate my recipes by the rate at which Amit finishes the dish. And this one actually was cleaned out in about 3-4 minutes. So now you can rate the dish yourself. Hope you enjoy the recipe and love it as much as I loved it. I was supposed to post this recipe last weekend but due to my very hectic schedule now, I was able to make the cookies but not the panna cotta last weekend. 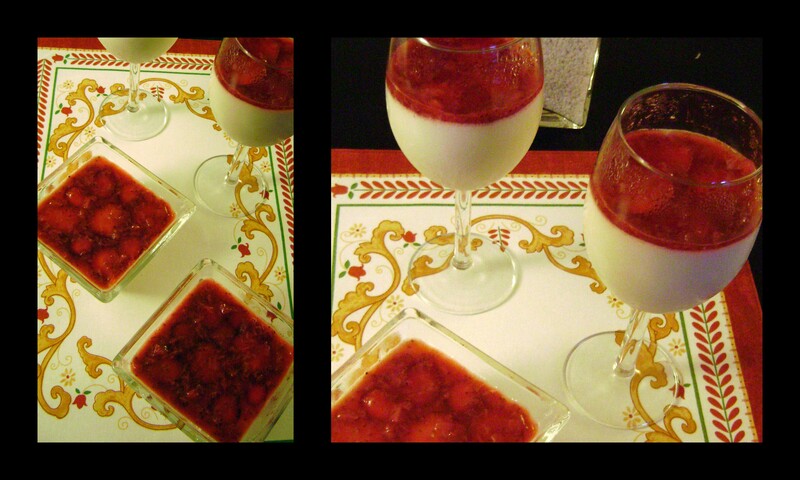 I added a layer of strawberry gelee over my vanilla panna cotta. The recipe for that follows. 1 cup (240 ml) (230 gm) (8 oz) fruit (strawberries, raspberries, mango, blackberry, etc. )*Note: Certain fruits interact with gelatin and stop it gelling like pineapple and kiwi etc. Place the fruit and sugar in a small saucepan and simmer until sugar has dissolved. Next add the triple sec and let the mixture come to a boil. Now mix the gelatin into the strawberry mixture and stir until gelatin has dissolved. Let the gelee mixture simmer till the fruit has completely disintegrated. Remove from heat and allow to cool (close to room temp, again, if you’re planning on layering on pouring on top of your Panna Cotta, a hot mixture will also heat up your chilled Panna Cotta). 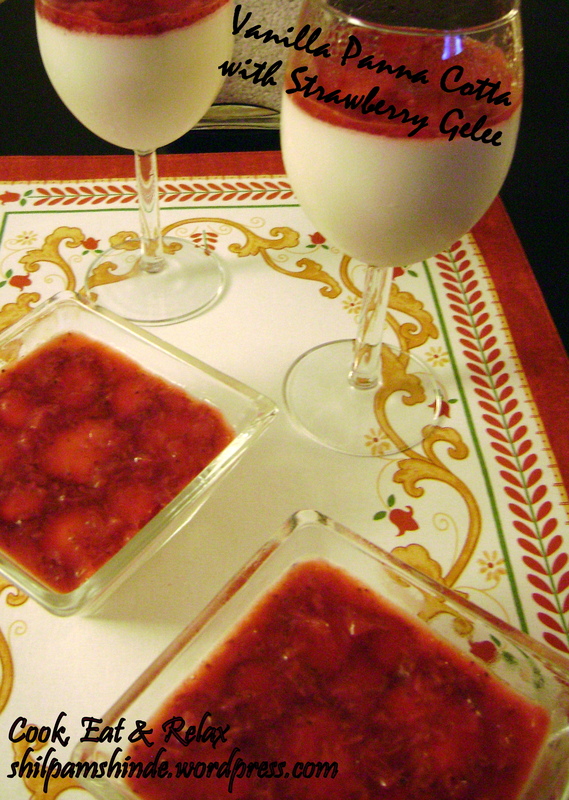 I added a few slices of strawberry over the chilled panna cotta before adding the gelee over it. This recipe is from the cookbook “Nestle Classic Recipes”. 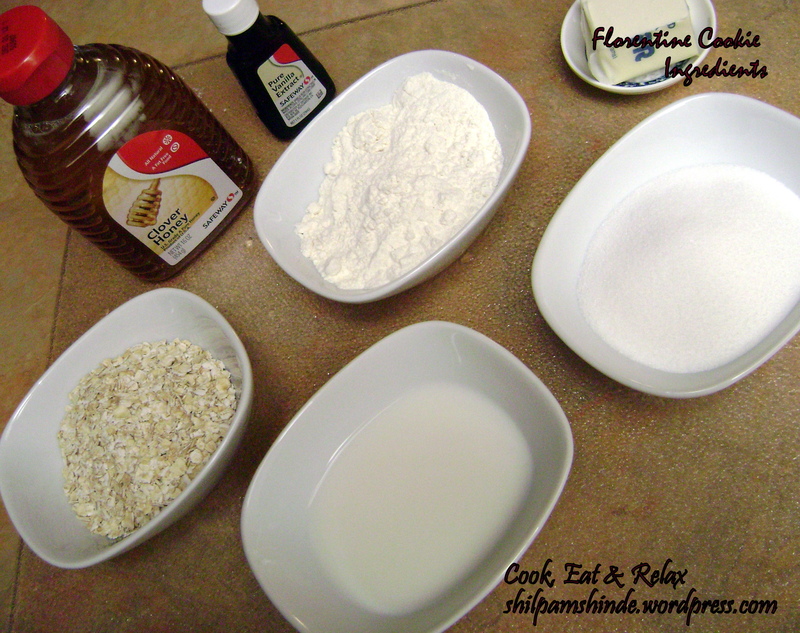 To the melted butter add oats, sugar, flour, corn syrup, milk, vanilla, and salt. Mix well.Drop a tablespoon full, three inches (75 mm) apart, onto your prepared baking sheet. Flatten slightly with the back of your tablespoon, or use a spatula. Spread a tablespoon of chocolate on the bottom/flat side of your cookie, sandwiching another (flat end) cookie atop the chocolate. I did not sandwich the cookies, I just added the chocolate over the cookie to form a hash pattern. Hope you enjoy these recipes as much as I enjoyed making and eating them. 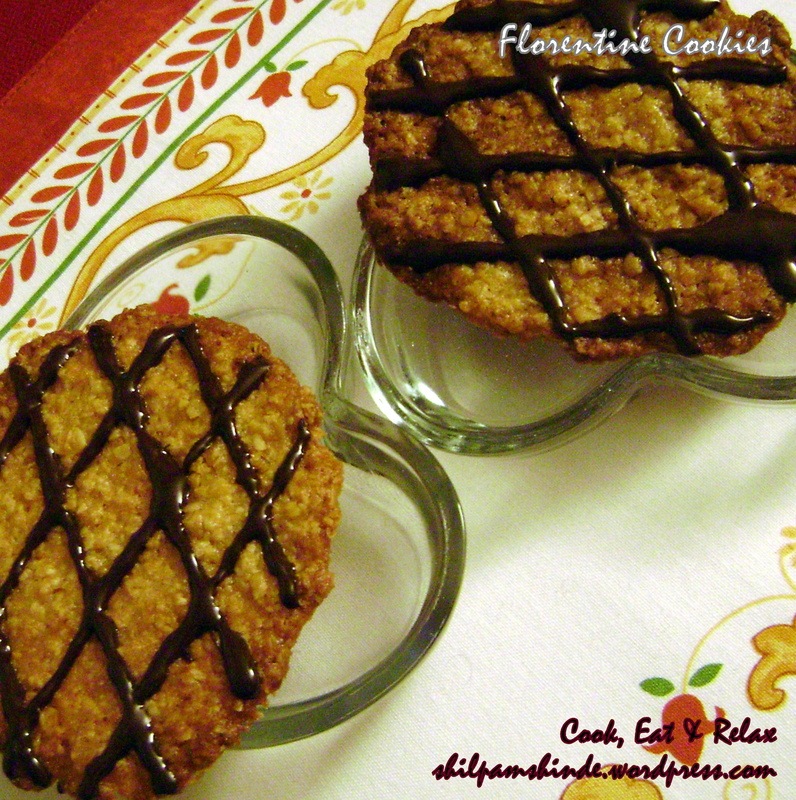 This entry was posted in Desserts and tagged Daring Baker, florentine cookies, Giada vanilla panna cotta, nestle florentine cookies, panna cotta, strawberry, strawberry gelee, the daring kitchen, vanilla panna cotta. Bookmark the permalink. WOW they both look so delicious the colours of the panna cotta looks so elegant and I think the berries which are slightly tart and the sweetness of the panna cotta would be a perfect foil, and the decoration of the cookies is superb well done on this challenge. Cheers from Audas in Sydney Australia. Thanks Audax. I was amazed by how simple and delicious the recipes were. I loved the challenge specially my husband… And yes, the tartness of the berries along with the sweetness of the panna cotta was just perfect!! !